Horse Transportation Information - Judge Manning Horse Transportation Inc.
Over the years, Judge Manning Horse Transportation has built a reputation, in part, on punctuality. 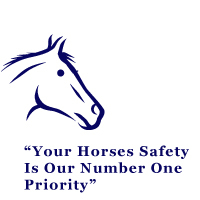 Our objective is to do our best to never keep you or your horses waiting, regardless of the circumstances. We'll come when you call us... to the right place at the right time. And we'll deliver on time with the speed and efficiency you'd expect from professionals. Local and long distance horse transportation serving Eastern United States and Canada. Private barns, horse shows, race tracks, airports, we'll get you there. We have regular horse transportation trips throughout the Eastern States and Canada. We are licensed to serve 48 States and all of Canada. We are happy to do special custom trips to suit your personal needs. Don't hesitate to give us a call and see what we can do for you. Our entire fleet has been custom built to our specifiations with the latest innovations in equine safety and comfort in mind. 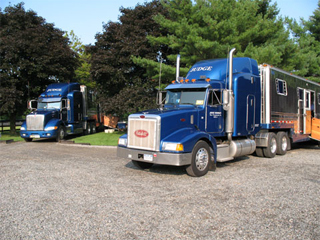 Air-Ride suspension is standard on every truck and close circuit cameras are available on all of our vehicles. Our entire fleet is fitted with GPS from Vehicle Tracking Solutions. This gives us the ability to see the location of our trucks and your precious cargo in real time. For more details about horse safety and GPS Vehicle Tracking and it's benefit to you, view this document from Blood Horse Magazine. With this equipment we offer service for private barns, horse shows, airports, vet clinics, emergencies, breeding trips, USDA Quarantine and more. Our employees are not just truck drivers. Sure, they know what they're doing behind the wheel because they know what's riding behind them. But more that that, as professional horsemen they also know what they are doing on the ground. Our staff will work with you and for you, to make sure everything goes smoothly from start to finish. We're fully licensed to operate as an interstate carrier throughout the United States and Canada. We're proud members of the National Horse Carriers Association, the United States Equestrian Federation and the New York Motor Truck Association. Whatever the number of horses, whenever and wherever they need to go, Judge Manning Horse Transportation, Inc. has the people, the equipment and the experience to deliver safely, reliably and economically. Call us - we're ready to go.